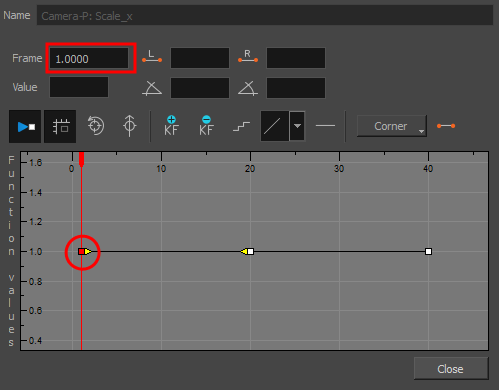 You can add keyframe directly on the graph using the Function view. 1. In the Timeline view, open the drawing or layer’s parameters by clicking the Expand button or press Alt + F.
Double-click on the parameter layer name to open the Function editor window or click once on the parameter layer to display it in the Function view's left sidebar. If you are using the Function view, you must click on the function name from the sidebar list to view it in the graph display region. In the graph section, click on the frame where you want to make changes. In the Frame field, enter the frame number. In the graph display area, the red playhead moves to that frame number. In the Function editor, click the Add Keyframe button. Click on the newly created keyframe and drag it up to increase the value of the function or down to decrease the value. Depending on the selected function, this could increase or decrease the width of the object (scale_x) or change the object's vertical position (position_y). Pull on the handles to create non-linear transition speeds between keyframes. 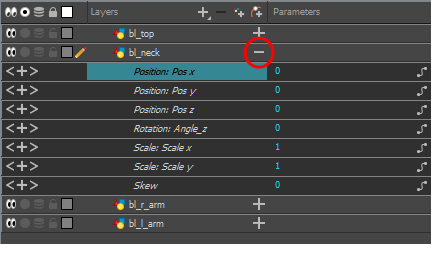 If you do not like the changes you just made, select and delete the new keyframe by pressing Delete or clicking the and Delete keyframe button. You can delete an existing keyframe by using the same process.